Deadstock fabric is quickly becoming an increasingly popular material choice for up-and-coming sustainable fashion brands and designers. Deadstock fabric is any uncut and still usable material that is leftover from normal garment factory production. This waste occurs for several reasons, the most common being a 1-2% tolerance that is standard for factories to order in case of mistakes or defects. 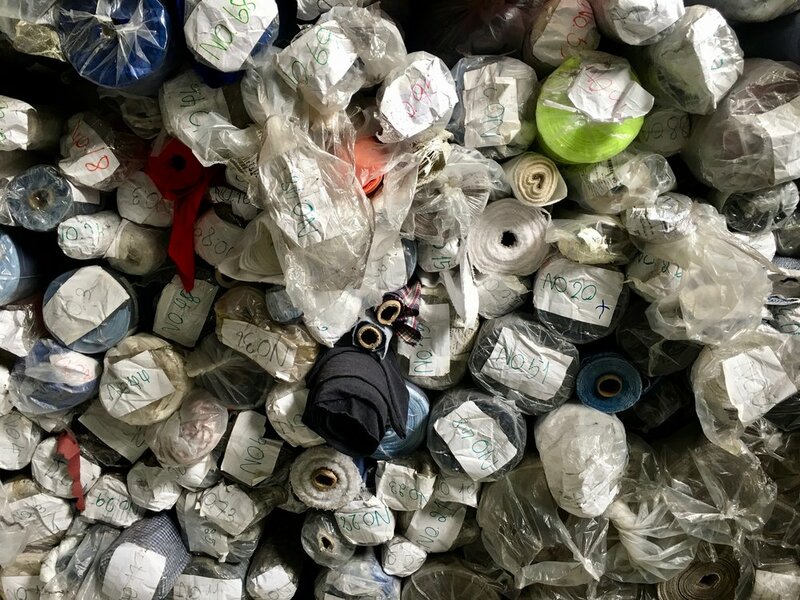 Another factor that contributes to waste is a high minimum order quantity (MOQ) when ordering fabric that forces factories to purchase more of one type of fabric than they truly need for a given order. It’s incredible how quickly fabric loses its value. In the fabric warehouses here in the Philippines where factory surplus fabrics are dumped, you’ll literally climb over piles of fabric laying on the dirty ground. Much of it will inevitably be ruined and tossed out. It’s a shame to see such a waste of resources. Much deadstock fabric continues to sit wasted and unused, simply because it’s more difficult for designers to incorporate into design/production than simply ordering new fabric in the exact color, weight, and material needed. It’s a struggle that I’ve been hassled through myself: If a TELAstory client wanted a batch of purple tee shirts made from deadstock fabric, I’d spend hours commuting to the warehouses and combing through messy piles in hopes of finding what the client is looking for. Many times, I’ve been unsuccessful in finding exactly what’s needed. Another con when using deadstock fabric is that once the textile you source is gone, it’s gone- no chance of finding it again for another batch of the same product or a re-order. A typical scene in a fabric warehouse where excess/waste fabric is sold by the kilo. Looking for a specific type or color of deadstock fabric is like finding a needle in a haystack. It’s definitely more environmentally kind to use already-existing deadstock fabric rather than contributing to the production of new textiles (especially synthetics). But there’s got to be a way to make this method of sourcing easier and more accessible in order for it to truly be a viable option for many brands. Enter brand-new startup, Moreloop. I first learned about Moreloop last year when I was speaking at a government conference on promoting circular economy within the textile industry. It was there that I met the two brilliant young entrepreneurs from Thailand, Amm and Amorpol, who created the company. 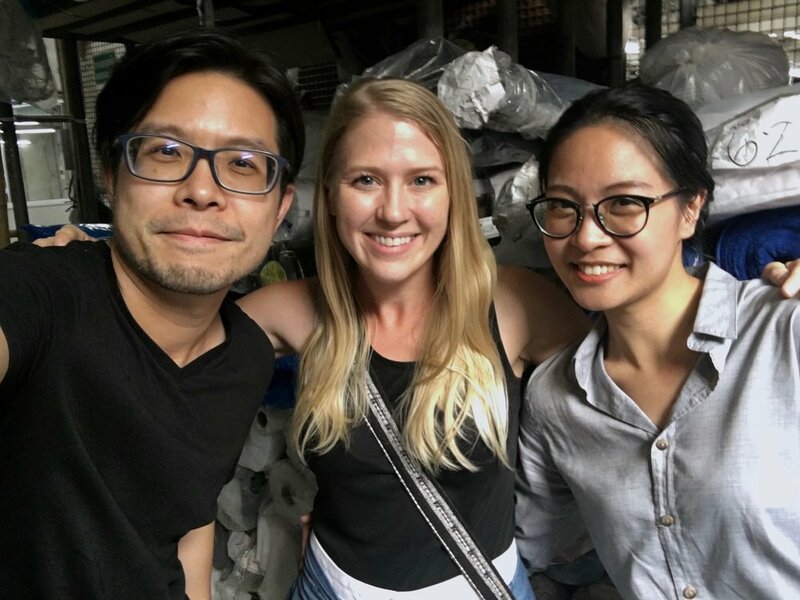 Moreloop aims to promote the use of deadstock fabric through connecting factories with buyers for their waste fabric. Amorpol, myself, and Amm on the day we met. On the consumers’ end, Amm and Amorpol have made sourcing deadstock fabric streamlined, efficient, and easy through creating an online marketplace where buyers can shop for available textiles by color, material, and quantity. Unlike the normal experience of purchasing deadstock fabric, Moreloop’s textiles are conveniently labeled with their exact fabric content, weight, and price. It’s a game changer for factory owners and ethical designers alike. I love that Moreloop’s website gives me the ability to filter results to search for only fabrics made with natural fibers, or to look for a specific color. A screenshot from Moreloop’s website. Deadstock textile sourcing made easy! Find what you’re looking for in just a few minutes with a few clicks of your mouse. I asked Amm and Amorpol to share a little bit about the background behind Moreloop, and the specific problems they’ve seen in the fashion industry that they’re trying to solve. Amm grew up in textiles, and helps run the family business, a garment factory in Bangkok. Amorpol comes from a background in the corporate world. LSJ: Without a background in textiles, how did you get interested in sustainable fashion? Amorpol: Originally, I wanted to make an online space for leftover industrial waste, mainly leftover / surplus materials from all industries. While i was testing my pain point assumption , Amm said there are surplus fabric piled up inside her factory. I realized that was a perfect starting place as it fits the criteria assumption; sunset industry, sizable (scaleable), there is an existing market and the waste is in a readily logisticable. Then, when we try to find the environmental impact from fashion industry, it turns out to be enormous and there is already an existing term for this subject, sustainable fashion. As a result, I became passionate about the subject and tried to absorb any information available in order to use it to promote the idea that our business’ impact on the environment and profit and go in tandem. To learn about a subject that makes a real impact makes me love solving this problem every moment. Organized and labeled deadstock at Moreloop HQ waiting to be purchased and used! LSJ: What is the problem in the fashion industry that you are trying to solve with Moreloop? Amm and Amorpol: On the demand side, we want to improve accessibility to quality resources. Moreloop can enhance small or starting businesses’ opportunity to access a variety of quality fabrics at affordable prices and low MOQ. We also want to educate on fabric construction. Most local designers and fashion entrepreneurs lack fiber and fabric construction knowledge. By labeling out our textiles correctly, we ensure that they can learn to differentiate each type of fabric and select items to suit their design objectives. We also believe that the material knowledge can entail better design overall. On the supply side, the main motivator is the environment. We want to reduce the existing material usage within the “fast fashion” system and help to curb new material production which not only consumes a vast amount of resources (water, energy), but also releases vast amount of pollution (chemical, CO2) in the process. LSJ: Why should designers and brands choose deadstock? What are the positive aspects of choosing to buy deadstock and are there any drawbacks? Firstly, using existing resources is environmentally friendlier as making new fabric which consumes a lot of resources such as energy and water, while releasing toxins such as CO2 and harmful chemicals in the dyeing process. Secondly, “deadstock” or “Surplus fabric” that Moreloop puts on our platform is curated from standard garment manufacturers so all the fabric has complete information on it’s composition, characteristics and function unlike those in the local market. Finally, Moreloop’s textiles are more accessible to a higher variety of clients (especially smaller brands) given our lower MOQ. The quantity is limited once it’s gone there is not repeat at the given MOQ. However given the composition, the designer can request the mill to weave it at higher MOQ or simply search for another similar textile in Moreloop’s database for reorders. With deadstock, the designer may not find the exact match of the fabric they imagine during their design stage (if the design is very specific). LSJ: Have you been able to connect with a lot of other factories to sell their deadstock fabrics? What have the reactions of other factory owners been like regarding your project? Amm: Yes, I have connected with over 10 factories currently. The owners are quite interested in the idea because they also want to sell their fabric at its original price or as close as possible. However, given the factory structure, they can’t open up textile sales personally to every small brand or individual designer so we are their solution to show their surplus fabric to others. We now have around 500 different type of fabrics on our platform and are continuing to add more! LSJ: What is your hope for the future of MORELOOP? What impact do you hope the business can have on the fashion industry over time? Amorpol: In the short term, we hope that Moreloop can prove that an online circular market such as Moreloop can become a sustainable and scalable business. In the long-term, we hope that, by using circular economy principles, we can create a new sustainable business model that makes multiple wins to all business stakeholders and the environment. Also, we hope the latter will incentivize consumers and businesses in the fashion industry to adopt the circular mindset as a norm, leading to a positive contribution towards sustainable fashion. Interested in learning more about Moreloop or sourcing fabric with them? Reach out through the company’s Website , Facebook, or Instagram. Alternately, shoot me an email and I’ll connect you to Amm and Amorpol personally. o A swatch (2”x1”) will cost you THB20/pc (less than $1.00 USD) excluding shipping fee. o Sample yardage costs x3 the original price listed on the Moreloop website. o Bulk MOQ is 1 roll (for small quantities available) or at least 50 yards or 20 kg. (for big quantities available) For example: If the platform shows 46 yds available, buyers are expected to take a whole roll. On the other hand, if the platform shows 500 yds available, a buyer can purchase at least 50 yards without surcharge (no need to take all 500 yds). For additional information, visit Moreloop’s website. Moreloop also has production capacity for men and women’s knitwear made from deadstock. I’m excited that Moreloop exists, and hope that it’s the start of an even bigger push in the fashion industry to move toward a circular economy model and use up the waste we’ve created before choosing new resources. Let’s all support Amm and Amorpol’s efforts as innovators and agents of change!